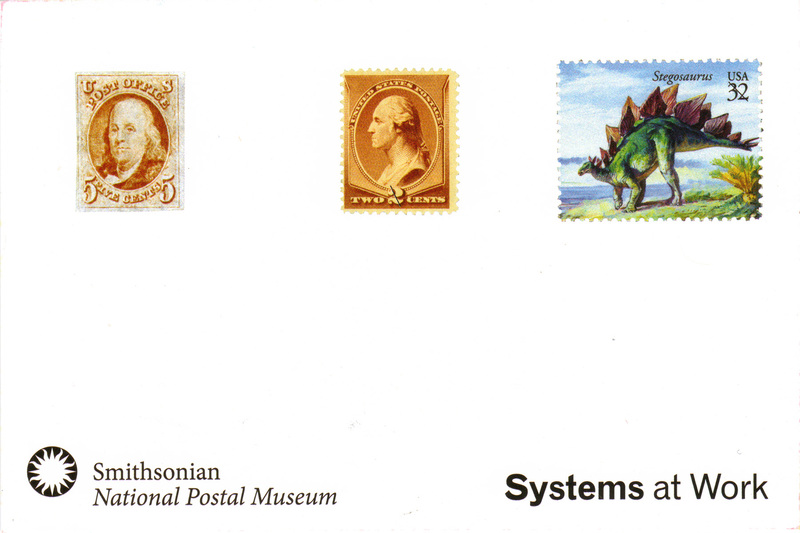 The Smithsonian Institution runs the National Postal Museum in Washington, DC. When I was home on that side of the country during winter break, my mum and I visited. It was surprisingly fun! And of course I used one of the Postal Museum stamps issued way back when the postage for a letter was only 29 cents. Now that much won’t even cover the cost to mail a postcard! But I love that I got this interesting cancellation on this stamp. 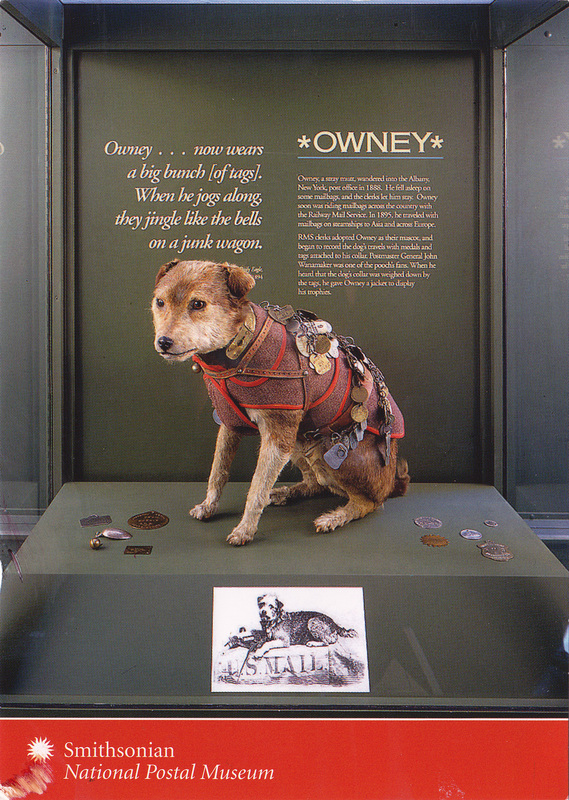 The postcard shows Owney the railway mail dog, who is the unofficial mascot for the Railway Mail Service. Now, the Railway Mail Service doesn’t exist anymore, but back in the late 1800s it was still operating and Owney rode the trains with the mailbags, eventually traveling all the way around the world. Owney certainly outlasted the Railway Mail, not only in the charming story, but also because his actual stuffed and preserved body is on display in the museum. That’s a little weird to me. Send me an email (deltiolog at gmail dot com) or leave a comment if you’re interested! First, this is awesome, now I want to plan a visit!!! I have brought the Owney stamps before, but what a neat thing to see as well as weird. I am so glad I read your blog or else I would have not known about this Museum until……? I am definitely interested in a swap!!! Thanks, you rock!!! I’ll send one of the cards I got to you, and use that nice inkwell stamp, too! They have replaced the stuffed Omney with a statue of the poor guy. Saw it yesterday. Aw no! A statue is less disturbing, though. True, not disturbing, but I know when I saw it, I thought, why on earth did someone make a brass terrier? Correction: Owney is now a statue, I don’t know where they put his little furry self. Saw the statue yesterday.